Evangelivm are as much an unknown to me as they would be to you. Even after trying to do some, albeit cursory, research, I still know little about the band except that it is a product of two mysterious souls descriptively named I and II. Evangelivm coming from Russia, it especially peaks my interest to know more about the band, but I guess we would have to settle for some powerful music and the faceless devotion from these two ideological servants of the Dark Lord. 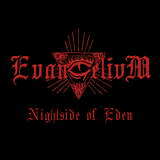 Satanic in intent, cover art visuals and execution, the last thing Nightside of Eden is ridiculous or poser. Instead of overproduced blasts, maddening shrieks and painted faces we get zero pictures of bandmembers, but a full load of ritualistic black metal. Operating at the fringes close to a more one-dimensional Deathspell Omega, Evangelivm opens up with a doomy clean and powerful overture Abyssus Abyssum Invocat In Voce Cataractarum Tuarum (my Latin is lacking but something about the beginning of the blind descent, I could be wrong however). Continuing to seek this religious angle you do not notice when the follow-up, The Void, becomes menacing. And then, when you are really ready, Corpus Dei comes out blasting on all cylinders, lasing away with those signature, sacramental atmosphere creating, slightly detuned angular guitars. Interrupted startlingly by deathly cutting riffs, by mid-album you will become a believer, if not in Satan, then at least in Evangelivm. Somewhere in the course of Nightside of Eden Evangelivm throws restraint of the intro and The Void to the dogs, unleashing the unstoppable force with understated blast, cymbals crashing and that hearty preachy oppressive penetrating voice of II (another reference to DsO). Divine Flames, finally, epitomizes the essence of the band’s style. Between higher register tremolo and another guitar track, which traverses much lower while still plowing melodic depth, the band manages to capture their message. It is full of belief in their cause, strength, entitlement and righteousness, all stated repeatedly over, and palpable with grim determination. Another short album in a recent trilogy of little known bands on Hammer of Hate makes a powerful statement.